Harmonix Blog: Yacht Rock Pack 01 Sets Sail! Yacht Rock Pack 01 Sets Sail! Throw on your captain’s hat and get ready to set sail with Rock Band on our inaugural voyage into a boundless sea of smooth. Yes, of course, we’re talking about Yacht Rock. Welcome aboard. 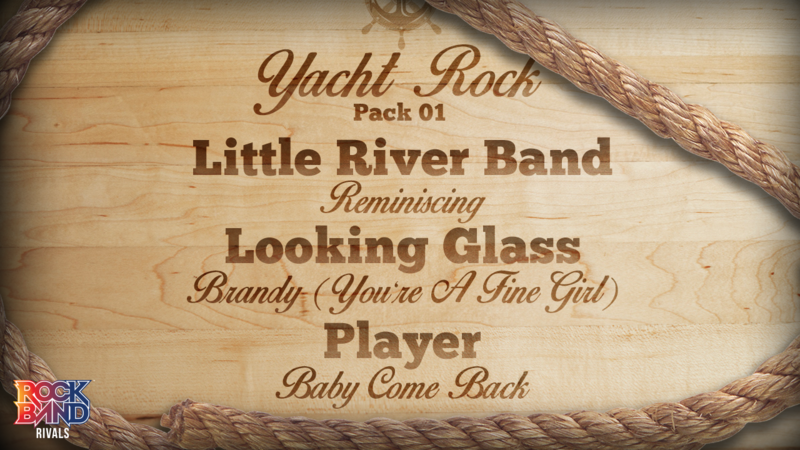 We’re proud to introduce our first official collection of Yacht Rock songs to the Rock Band DLC catalog with this pack. The Yacht Rock category is not without its controversy, with many a heated internet debate around what is, or is not, considered Yacht Rock. While many of the criteria are subjective, one point of consistency reigns: Yacht Rock songs are all silky smooth. VIDEO: Rock Band 4 DLC Week of 7/03: Yacht Rock Pack 01! Yacht Rock Pack 01 can be purchased for $5.49. Songs can be purchased individually for $1.99 each. Little River Band - "Reminiscing"
* Please note that this week’s DLC tracks will be available for purchase on Tuesday, July 3rd.